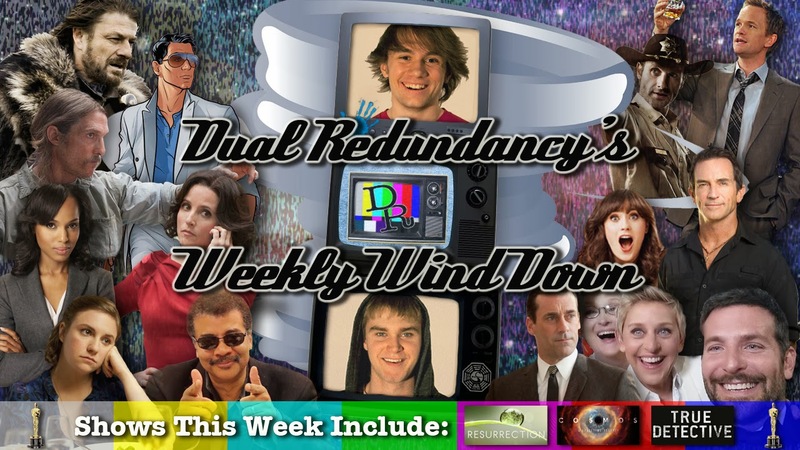 Dual Redundancy: Podcast Episode 53: Winding Down: The 2014 Oscars "Resurrection" "Cosmos: A Spacetime Odyssey" & "True Detective"
Podcast Episode 53: Winding Down: The 2014 Oscars "Resurrection" "Cosmos: A Spacetime Odyssey" & "True Detective"
In this week's episode we recap the 86th Academy Awards (1:53) including Batkid's snubbed segment (4:38) and the feud between the writer and director of "12 Years A Slave" (10:00). We also wind down Resurrection's pilot called "The Returned" (14:10), the premiere of Cosmos: A Spacetime Odyssey (24:19) and the season one finale of True Detective called "Form and Void" (36:29). Finally, we explain our third annual March Madness bracket and who moved on to round two (54:11). Dual Redundancy is Back on ICTV!